On New Years Day we had breakfast on the Wharf, then walked around the harbor to the breakwater, and then out across the rocks to the beach at the tip of the breakwater that forms one side of the opening to the marina. Part of our purpose was exercise and general sight-seeing, but we were also curious about the amazing explosion in the population of pelicans. The birds have been common as long as we’ve lived here (since 2001), but outnumbered by gulls, which are by far the most common shore birds, pretty much everywhere in temperate climes. 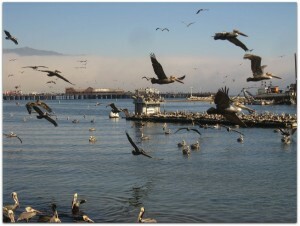 But here the gulls now seem crowded out by the California Brown Pelican, once an endangered species. Thousands, it seemed, now all but owned the beach at the end of the breakwater. So the kid and I went out there to investigate the matter. This photo set follows the walk, and shares some of what we discovered. I neglected to take my good camera with me, which is a bit of a bummer: no art shots or close-ups. But I still got some good-enough shots with the little pocket Canon, plus a video I’ll put up after I get back to Boston and better bandwidth. I grew up in Santa Barbara, and I’m in my early 60’s. There was a day when the Pelicans were almost gone. Can’t remember whether from DDT or mercury. Or both. You can’t do just one thing, and you can’t know in advance the consequences of the solution to a problem. Have you seen the crows (or ravens?) around Santa Barbara now? More than I have every seen. They are eating all the black rubber off the windshield wipers on the cars. Now I see they are eating the rubber bordering the doors on the houses. What is that all about? Pelicans fall out of sky from Mexico to Ore. It is good to see the Pelicans recover in numbers. I have never seen that many Pelicans all at once here in Florida.